Chicken and rice casserole recipes are some of the best recipes to make when you are cooking for a crowd. There is such a great selection of ingredients to choose from which go well with both chicken and rice. The seasonings are endless for whatever flavors you want to accomplish; whether it be plain, Oriental or spicy Mexican. Chicken and rice casserole recipes make great crowd size recipes because they are so convenient. Most of them can be prepared a day ahead leaving you more time to take care of other things. On the day of serving just remove from refrigerator and place in the oven. How easy can it be! Chicken and rice casserole recipes are also good from an economical view. They are cheap recipes to prepare; whole chicken are about the cheapest form of meat to serve a large crowd and chicken is the favorite choice of most people. There are a few things which you need to remember when cooking for a crowd. The ratio of chicken verses the rice varies from recipe to recipe. Most figure the equivalent of a quarter of chicken for each serving and about one cup of rice. Of course this will depend on the person you are feeding; certainly a child will not require as big a serving as an adult so this should be taken into consideration. Some cooks, I for one, always want to make sure I offer enough chicken in my casseroles. Chicken and rice casserole recipes with not much chicken is a “bad thing” for me; it needs to have a good balance. This also needs to be considered when adding other ingredients like bean sprouts or water chestnuts. Also casseroles should be moist; this is done with the addition of ingredients like sour cream and mayonnaise. Most important chicken and rice casserole recipes must be flavorful. This is done with seasonings. Condensed soups like cream of chicken soup and cream of mushroom add a very good taste. Salt, pepper, garlic and other spices enhance the flavor so don’t forget them! Another very important thing to remember when preparing crowd size recipes, is the cooking of them. The size of the baking pans which you are using can change your baking time greatly. Always make sure your food is hot and cooked thoroughly before serving to anyone. In the case of cooking raw chicken, it should be very tender and showing no pink in color. In large Dutch oven (OR roaster) brown chicken, bell pepper, celery and garlic in hot vegetable oil. Drain canned tomatoes reserving juice; measure juice with enough water to make 1 CUP. Add tomatoes, tomato liquid, tomato sauce rice, bay leaves and red pepper to the mixture. Bring mixture to a boil; PREHEAT OVEN TO 350F degrees. Dissolve bouillon in boiling water; stir into the boiling mixture. Add the chili powder and sugar; cover pan and bake for 35 minutes. NOTE: Be sure your pan is big enough or transfer to larger roaster. Rice with expand and may cook over in your oven. REMOVE BAY LEAVES before serving; serves about 12. Make 14 servings (1 cup each). 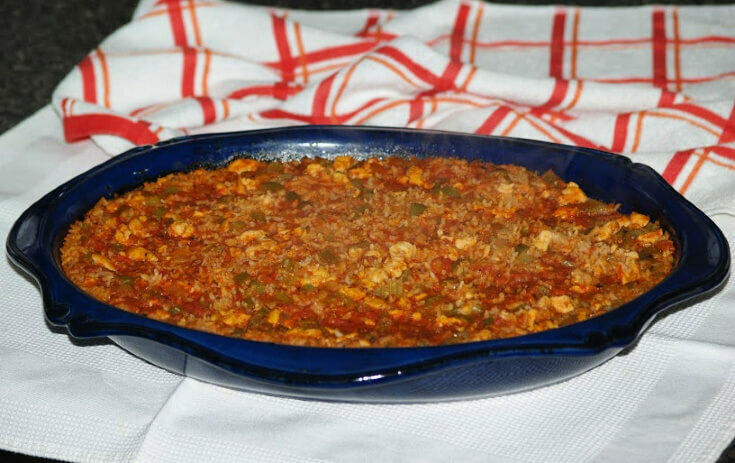 This is one of the chicken and rice casserole recipes which is made with chicken pieces and allows for one quarter of chicken per serving; this recipe for 40 servings. NOTE: Sometimes I like to add chopped celery, green peppers, garlic, chopped tomatoes or even water chestnuts to the rice. You might try seasoning the rice with chili powder, curry, cumin or turmeric. Place rice in bottom of greased pans; sprinkle with onion soup mix. Divide butter among pans and drizzle over top. Place chicken pieces on the top of each pan of rice. Sprinkle chicken with salt, pepper and paprika. Bake 1 ½ to 2 hours or until chicken is tender. NOTE: The length of baking time will vary on how many pans you use and how many in one oven. This recipe can be prepared a day before and refrigerated. 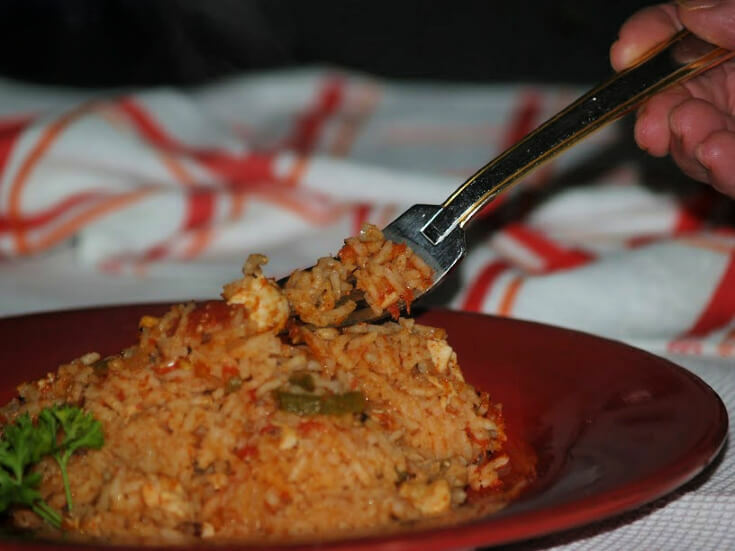 This is one of the chicken and rice casserole recipes with bite size chicken pieces blended into the rice. The sour cream and mushrooms makes this a very delicious recipe that is always a hit. Cover chickens with water; add salt, pepper, curry powder, onion and celery; cover, bring to a boil, reduce heat and simmer until chickens are tender. Wash mushrooms, pat dry and cut in pieces or slice. Measure chicken broth and use for cooking rice substituting it for liquid according to the directions on the packages. (Cook for firm rice). Combine the chicken, rice and mushrooms (Not reserved mushrooms). Blend together the sour cream and undiluted mushroom soup; blend in with chicken mixture. Divide evenly into greased baking pans; arrange reserved mushrooms on top of casseroles. NOTE: You can add all the mushrooms to the casseroles and top casseroles with grated cheese before baking. This chicken and rice casserole recipes is a delicious Oriental dish! Sprinkle chopped chicken with soy sauce and lemon juice. Add bean sprouts, celery, mayonnaise, onion, water chestnuts, salt and pepper; add rice and mix well. Pour into greased or buttered baking pans; Bake 30 to 40 minutes or until thoroughly hot, depending on pan sizes. In a large container combine and mix chicken, eggs and rice. Lightly grease a large baking pan or roaster. Dump casserole mixture into pan and smooth top to level. NOTE: Set casserole out at room temperature 1 hour before baking. Remove plastic wrap and cover with aluminum foil. Bake about 1 hour until thoroughly heated; serves 12. In a large baking pan or roaster combine soup, water, mushrooms and rice. Stir in half of the onions; arrange chicken pieces over the rice mixture. Sprinkle top with paprika and pepper; bake for 45 to 60 minutes until chicken is tender. Sprinkle remaining onions over the chicken; bake 3 minutes longer.